Every cell contains a blueprint for life in the form of DNA, a polymeric molecule with unique physical and chemical properties. Despite its prominent role in central biological processes such as replication, transcription and repair, single-stranded DNA has been the subject of few studies compared to double-stranded DNA. It is desirable to have accurate computational models of ssDNA to assist in the interpretation of experimental results. However, the gold-standard of biomolecular computational modeling—all-atom molecular dynamics simulation—is too computationally demanding to simulate even short (<100 nt) DNA fragments. A simpler coarse-grained model is needed. Stimulated by the dirth of reliable coarse-grained single-stranded DNA models, a the Aksimentiev and Ha groups collaborated to create the first computational model of DNA specifically optimized for single-stranded DNA using. Parameterized against a combination of structural properties extracted from all-atom simulation and from experiment, the model reproduces experimentally measured force-extension dependence of a poly(dT) strand across two orders of magnitude of the applied force. The accuracy of the model was confirmed by measuring the end-to-end distance of a dT14 fragment via FRET while stretching the molecules using optical tweezers. The low computational demands and high accuracy of the model enable its use in the design of new DNA nanotechnology devices and the interpretation of single-molecule experiments. A simple coarse-grained model of single-stranded DNA (ssDNA) was developed, featuring only two sites per nucleotide that represent the centers of mass of the backbone and sugar/base groups. 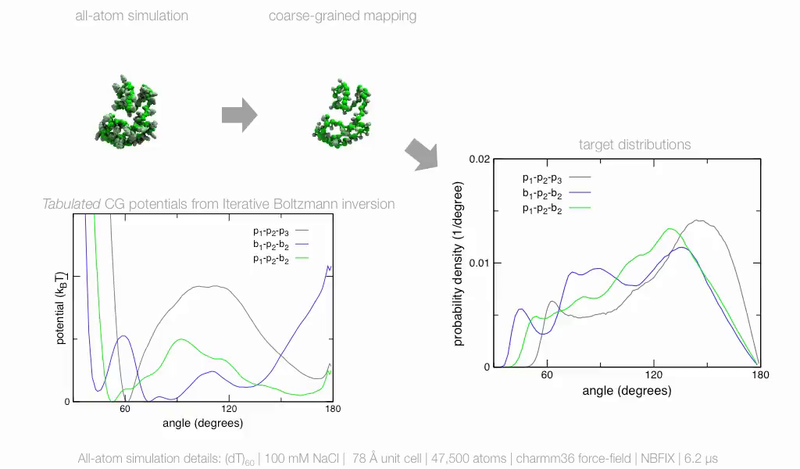 In the model, the interactions between sites are described using tabulated bonded potentials optimized to reproduce the solution structure of DNA observed in atomistic molecular dynamics simulations. Isotropic potentials describe nonbonded interactions, implicitly taking into account the solvent conditions to match the experimentally determined radius of gyration of ssDNA. The model reproduces experimentally measured force–extension dependence of an unstructured DNA strand across 2 orders of magnitude of the applied force. The accuracy of the model was confirmed by measuring the end-to-end distance of a dT14 fragment via FRET while stretching the molecules using optical tweezers. The model offers straightforward generalization to systems containing double-stranded DNA and DNA binding proteins. To develop our coarse-grained model of ssDNA, we first performed an all-atom reference simulation of dT60 using current best practices for simulations involving DNA–ion interactions. The all-atom trajectory was mapped into a coarse-grained representation featuring two beads per nucleotide. Distributions of bonds, angles and dihedral angles as well as non-bonded pair distribution functions were extracted from the coarse-grained reference trajectory. Using iterative Boltzmann inversion, coarse-grained potentials were iteratively tuned until simultations produced distributions that closely matched the reference distributions. After the coarse-grained potentials were refined to reproduce distributions extracted from all-atom simulation, the coarse-grained ssDNA was found to have a smaller radius of gyration (a measure of size) than expected from experiment. We added a small amount of Yukawa repulsion between non-bonded P beads until the radius of gyration for a 60-nucleotide fragment matched experimental measurements. No further adjustements were made to the model. The coarse-grained DNA model accurately capture the elastic response of ssDNA to force. Here, the applied force varied from 2 pN (pink) to 20 pN (red) and was applied along the vertical axis. Our coarse-grained DNA model can be easily extended. For example, by adding several harmonic restraints to the ssDNA model we developed a toy coarse-grained model of dsDNA that accurately captured the persistence length of ssDNA.